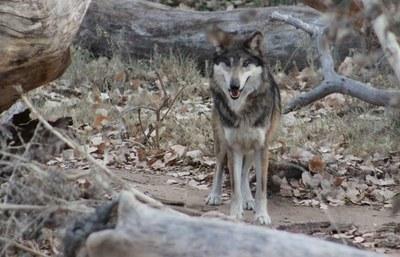 Ryder, a 4-year-old male wolf now living at the ABQ BioPark. A New Mexico rancher who trapped an endangered Mexican gray wolf and hit it with a shovel says he will appeal the loss of his grazing permit. Three young Mexican gray wolves from the California Wolf Center in Julian, California, have made a new home in Prescott, Arizona. Wildlife managers have found tracks that might have been left by an endangered Mexican wolf that escaped from a Colorado wildlife center, but the animal hasn't been seen for two weeks. A federal court has lifted an injunction that prevented federal wildlife agents from releasing more endangered Mexican gray wolves in New Mexico.